huge variety of rigid materials including, timber, acrylic, banner fabrics, pvc, metal, aluminium composites and glass has won us international recognition. Real timber veneered mdf comes in a variety of finishes (cherry, beech, maple, white oak or pine) and can be printed to produce subtle, natural decorative effects. 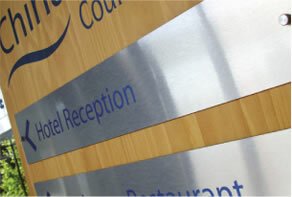 Printed panels can be incorporated into furniture, interior design as well as display and signage.